​Agenor was a reoccurring name in Greek mythology, but arguably, the most famous Agenor was a king of the Middle East, whose children was said to have included Cadmus and Europa. The family line of Agenor is not always clear, with different generations of the family line often confused; most commonly though, it was said that Agenor was the son of the Greek sea god Poseidon, and Libya, the daughter of King Epaphus. With this parentage it was said that Agenor had a twin brother named Belus. Later writers also added two further brothers for Agenor, in the form of Cepheus and Phineus. Some confusion then arises because a number of ancient sources tell of Agenor being not a brother of Belus, but a son. ​Belus would become king of the land known as Libya; Libya being the country that, at the time, was said to extend across the northern coastline of Africa. Agenor would depart from Africa, and set up a new home for himself in the land that would later be known as Phoenicia. Agenor is named by some as the founder of the famous cities of Tyre and Sidon. ​There is only limited consensus amongst ancient sources as to the whom Agenor was married to. The most commonly mentioned wife of Agenor was Argiope, potentially a Naiad nymph, but also talked of, were Telephassa, Tyro, and two daughters of Belus, Antiope and Damno. The lack of consensus about who Agenor was wed to, also gives many different variations upon who his children were; with Cadmus, Europa, Cilix, Phoenix, Thasus, Phineus, Isaia, and Melia, all named in at least one prominent ancient source. ​The children of Agenor, or at least Cadmus and Europa, are today more famous than their father, although their fame are all connected with the tale of the abduction of Agenor’s daughter Europa. 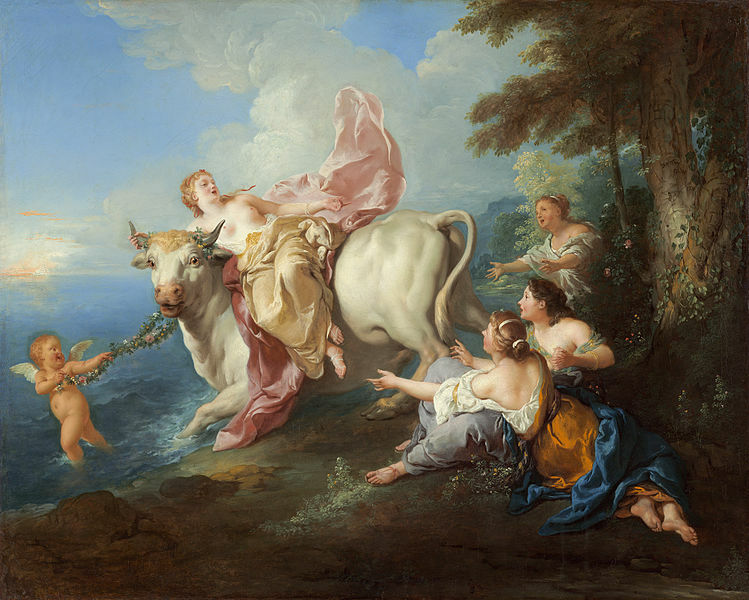 The beautiful Europa was spied by Zeus as she picked flowers by the sea shore. Wishing to have his way with Europa, Zeus transformed himself into a magnificent bull, and Europa was enticed to sit upon his back. Once Europa was safely seated, Zeus made his way into the sea, and swam away from the land of Agenor. Eventually, Zeus and Europa would land upon the island of Crete. Agenor, unaware of what fate had befallen Europa, tasked his sons with finding their sister. No mortal though could discover what a god had decided to keep a secret, and so the sons of Agenor had an impossible task, and so they would leave Agenor’s realm never to return. Cadmus would of course arrive upon mainland Greece, but having consulted with the Oracle of Delphi, would abandon the search for Europa and would instead found the city of Thebes (Cadmea). Cilix would travel to Asia Minor where he found the region of Cilia; Thasus would reach a large island off of Thrace which was named Thasos after him, as was the island’s largest town; and Phoenix would travel the shortest distance for the land of Phoenicia was named after this son of Agenor. ​As to the other children commonly mentioned, it is not clear as which Phineus is the son of Agenor, for some tell he was the man encountered in Thrace by the Argonauts, whilst others tell of him being the man confronted by Perseus in Aethiopia (although this latter Phineus is more normally talked of as a brother of Agenor. ​The daughters of Agenor named Isaia and Melia, are said by some to have been wives of Agenor’s nephews, sons of Belus, Aegyptus and Danaus. After the departure of his sons, and Europa, nothing more is said of Agenor.